I really wanted to get my test strip prescription refilled this morning, before the weekend, but I’m about six days too early unfortunately. There are lots of things happening this weekend, so today was pretty busy day to get ready for it all, meaning I wasn’t sitting in front of my computer or listening for the ding of a new email. I thought it was interesting how my Walgreens app hadn’t notified me that the script was ready, so I checked my email. That is when I saw the the email that insurance has denied payment (until June 20). I was frustrated that I needed to check my email to find this information, because if I had shown up and they said, “$400 please,” I would have cried. Where did I turn? Twitter of course. I received a few +1’s, the Walgreens Social Care twitter team reached out to me. They sent me a direct message asking me what the problem was, where I am and a way to get in touch with me. I explained the situation and received a case number in return and a notice that management will review my concern. Okay, no big deal. I was then waiting to pick the kids up from school when they called, and the message said that they would like to speak with me and my suggestion has been passed on to the app development team. I just got off the phone with them and I have to say that I am really pleased with the way such a big company has handled such a tiny vent. The woman told me she really liked my suggestion and thinks a lot of patients would also find this useful and hopefully they can make it work! I love twitter because so many of my friends “live” there, but I also love how it can connect you and potentially gives the power to change. 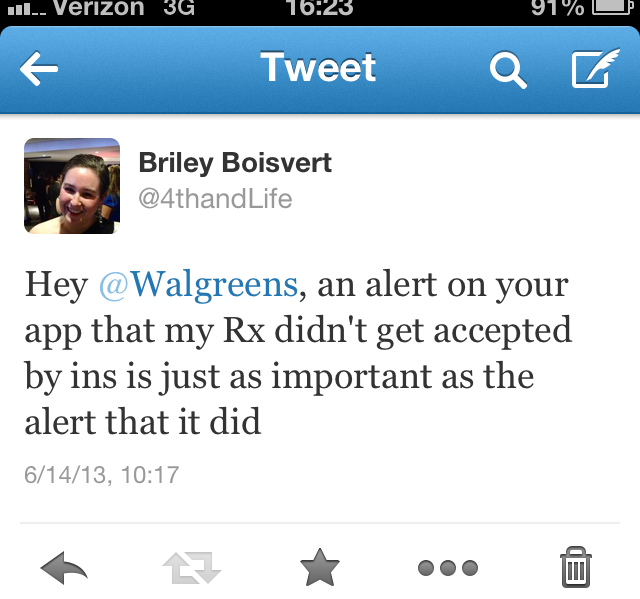 Thank you for paying attention Walgreens and caring about your patients! This is an amazing idea!!!! Glad YOU thought of it! Awesome! I use Walgreens, so this will help me out as well. 🙂 Glad they listened. Gosh that WOULD be nice. I wonder if it would alert us if insurance has decided to approve the prescription for less than the doctor wrote as well.